People seemed to like the first pizza post, so here is another one . Something a little different this time - very simple but delicious. Melt the butter with the olive oil in a frying pan. Slice the onion finely and gently sauté for 5-10 minutes until the onion start to shine. Add in just a little (half a teaspoon or so) of sugar and continue to cook. Add the finely chopped garlic and cook some more, don't let it burn. Remove the onion mixture from the pan. Peel, core, and slice the pears into wedges, removing the pips. Add a little water to the pan that the onions were cooked it and add the pears. Let the water boil down for a while to soften the pears then add some more butter and a little sugar. Sauté for a few minutes until the wedges are soft and just starting to brown. Take the pizza base and put it on the heated oven tray. 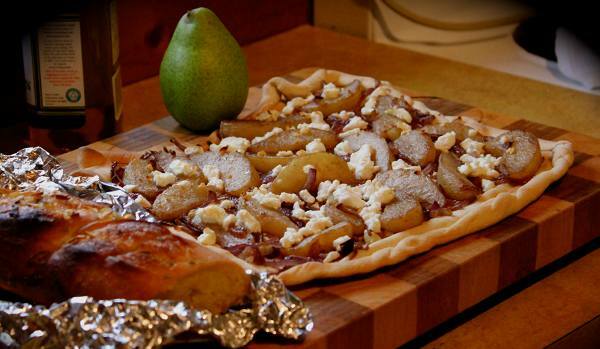 Top with the onions, then the pears, finally crumbling feta across the top. Place in oven and wait.